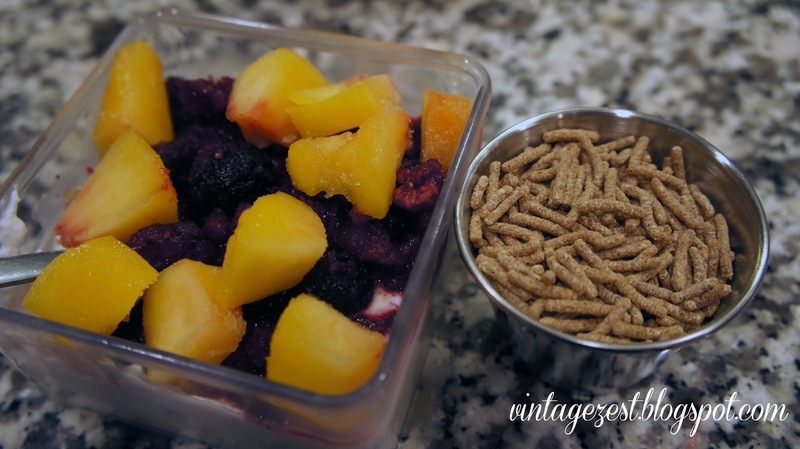 Favorite Breakfast #3: Yogurt & Fruit Cups ~ Diane's Vintage Zest! People who know me through this blog surprised to know I'm a creature of habit when it comes to my eating habits at home. I love exploring new restaurants and new dishes, so I rarely visit the same place or order the same thing twice. There is nothing I like better than having something different! However, I usually eat a few items that I love over and over again at home for breakfast and lunch. Just like my egg & veggie medley and the egg & veggie muffins, this is a staple for my breakfasts. Depending on how hungry I am, I'll either have this right away after my eggs or wait to have it as a mid-morning snack. 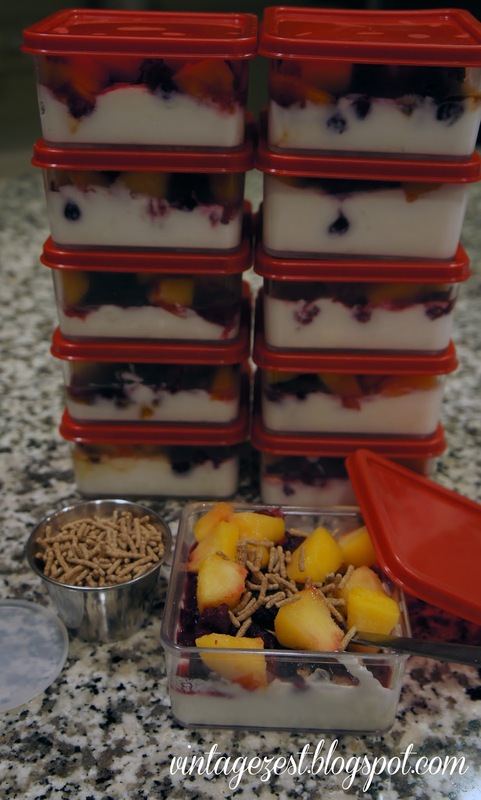 These yogurt and fruit cups are great because there are no artificial sweeteners or preservatives and I reduce the amount of waste that I create by using reusable containers. And of course, it's portable and in individual portions, so I can just grab and go in the morning! 1. 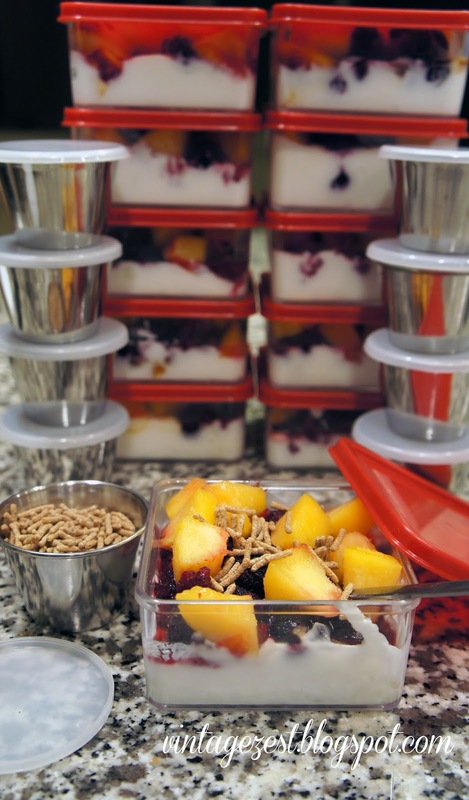 Place an equal amount of yogurt into each of your individual containers. *I used Greek yogurt this time, but I switch it up depending on the week! 2. Mix in any extras that you would like to use. 3. Mix in the amount of sweetener, to your taste. * I like using agave nectar. Other good sweeteners to use are honey, applesauce, maple syrup, mashed persimmons, date sugar, etc. 4. Top with your favorite fruit! 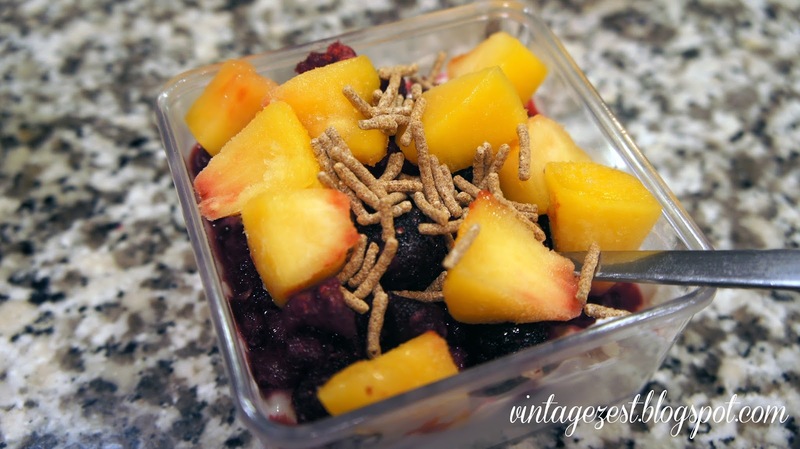 *In the dead of winter when I took these pictures, I used frozen berries and nectarines, but I prefer to use fresh ones, of course. 5. Put your topping of choice into individual little containers. *I use fiber cereal most of the time, but I have also used granola, nuts, etc. for just a bit of crunch and flavor! 6. Admire your neat little breakfasts for the next week. These are quick, simple, tasty, and nutritious. All I could I could ask for in a breakfast or snack! Alternatively, you could also mix your large tub of yogurt with the sweetener and mix-ins before putting them into the individual containers, like mixing batter for muffins. :) It will save a bit of time, but I kind of like the assembly line method too! What are your favorite "pre-packaged" breakfasts? We always have oatmeal for breakfast but I make yogurt parfaits for mid-day snacks. Great idea to make them ahead! Thanks for sharing at The Creative HomeAcre Hop. Hope to see you again this week. This is a great idea! You may want to do some research on agave..it's not the health food it's promoted to be..
You were ahead of me on A Little Bird Told Me link party. Thanks for sharing, these look awesome. I really need to get back into the habit of fruit and yogurt for breakfast. Something I used to do that you may want to try is making these into a smoothie for a quick breakfast on the go. 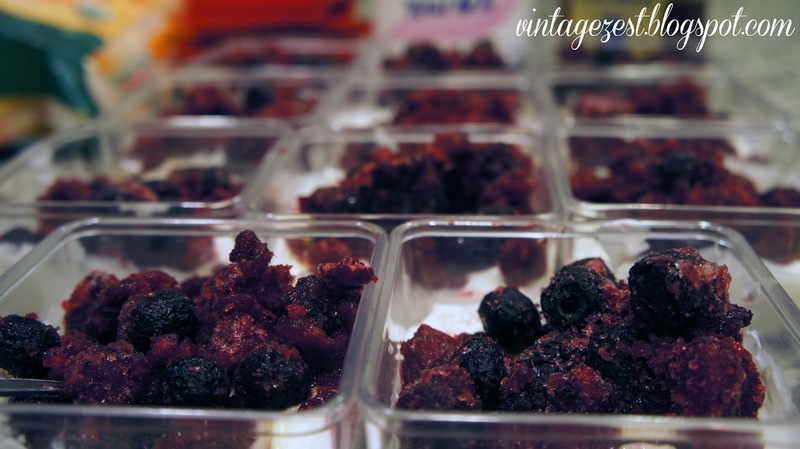 If you use frozen fruit instead of fresh, you don't need to add ice. All you need to do is add a bit of fruit juice. Great idea! I used to make smoothies back in the day, and I'll definitely have to start up again. :) Thanks for the reminder! Love this! I posted a similar idea this week making smoothie packets. Thanks for coming by and linking up at my Real Family Fun link party. I hope to see you again next week. Thank you for linking up to Create & Inspire last week! Tonight we're featuring YOU! Hope to see you there! Such a great idea! I need to take some time to do this! I'll be featuring it on my blog tomorrow. Yum! I love pre-made meals like this! Grab & go! Me too, otherwise I'm reaching for cookies instead. Eek! Yum, I love that you make them up a head of time! So clever! Thank you for spreading JOY and sharing at the Oh What a HAPPY Day party. I need to do it all at once, otherwise I'll leave my groceries untouched in the fridge. It's a system that grew out of sheer laziness! This would be a really great habit to get into! I usually keep a basket of granola bars in the pantry and we grab one on the go. You can see my pantry design here: http://redesignedbym.wordpress.com/2013/03/22/pantry-makeover/ Thanks for this idea! ~M. Love the idea. Pinned. Thank you for sharing. What a great idea. No more scrambling around the kitchen to put breakfast together.